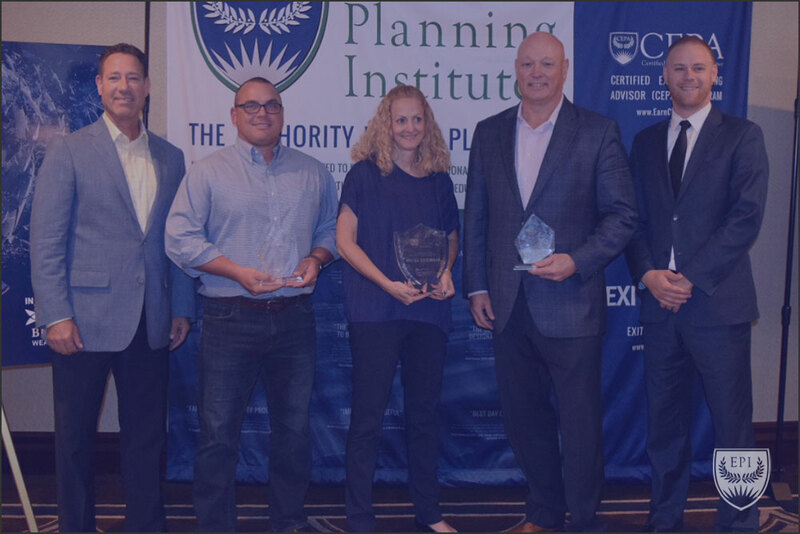 Congratulations to the 2018 Excellence in Exit Planning Award Winners! 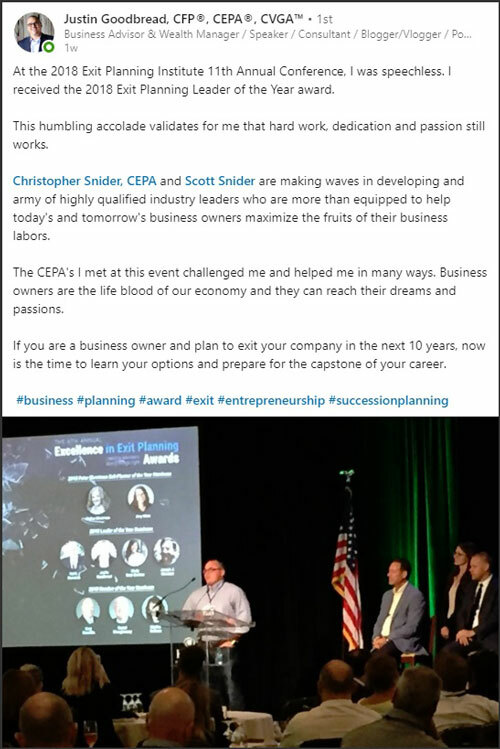 Image: Christopher Snider, EPI CEO/President; Justin Goodbread, CEPA, 2018 Leader of the Year Honoree; Melisa Silverman, CEPA, 2018 Peter Christman Exit Planner of the Year Honoree; Gary Rzucidlo, CEPA, 2018 Member of the Year Honoree; Scott Snider, EPI Vice President. The exit planning profession poses unique challenges and opportunities. The advisors leading this industry tend to be more entrepreneurial, display high leadership, and are instrumental in driving best practices for their peers and for business owners themselves. 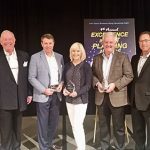 The closing event at the 2018 Exit Planning Summit is the Excellence in Exit Planning Award Luncheon, where the executive leadership team of the Exit Planning Institute takes the stage and recognizes those exit planners that are making a remarkable impact on the local and global community. Melisa Silverman (CEPA since 2016) embodies the true spirit of a pioneering entrepreneur. Two years ago, in an incredibly competitive California marketplace, while maintaining a thriving valuation practice, Silverman launched and grew a national exit planning practice alongside two other CEPAs. In that same period of time, she founded the EPI Greater Los Angeles Chapter and has led a diverse team of collaborative advisors to forge key relationships with major universities and owner groups. Silverman’s success is bigger than herself. Silverman regularly contributes to the CEPA community and the larger profession in the form of speeches, webinars, written content, coaching, and insight sharing. Her leadership is felt on a local, national, and industry-wide scale. Thought leadership is a brand stamp of Justin Goodbread (CEPA since 2017). As one of the youngest CEPAs to enter the community in recent years, Goodbread has quickly established himself as a major contributor of insight, strategy, and leadership. As the founder of Heritage Investors, Justin leaned into his authenticity and entrepreneurial talent which has resulted in a dominant idea-sharing brand machine that educates millions of owners and advisors worldwide on exit planning, financial advising, and business strategy. Rather than withhold his success model as a secret recipe, Goodbread continuously teaches on the EPI community platforms via live events and webinars to help other CEPAs leverage his expertise and lessons learned. 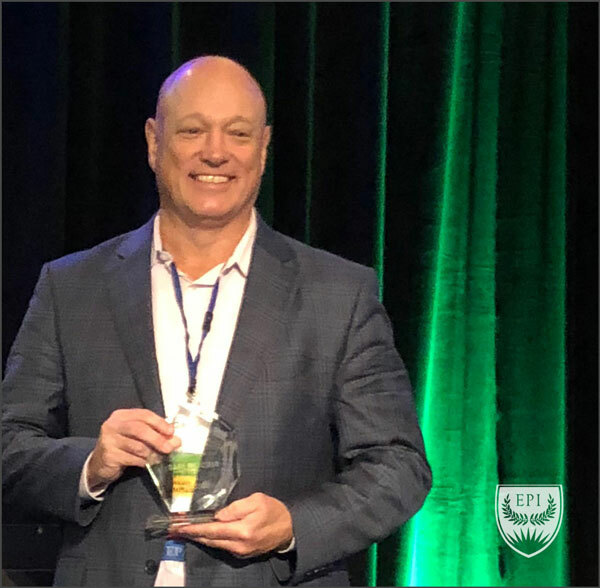 In fact, he was a main stage speaker for the fisrt ever EPI Power Sessions at the 2018 Exit Planning Summit, where he did a TED-style talk on how advisors everywhere can increase their authenticity to increase their business development success. He is a leading contributor in all senses of the word to the profession and spreads mass awareness. Gary Rzucidlo (CEPA since 2015) continues to raise the bar and lead the CEPA community with best practices. He is a talented influencer and thought leader, bringing exit planning to the forefront within a major organization. Rzucidlo assisted in the implementation and supported the central office firm to build its exit planning education and owner engagement tools/training. Locally, Rzucidlo is the President of a thriving chapter while simultaneously running owner education sessions with his key partners. And his local impact doesn’t stop with business initiatives. In 2018, Rzucidlo and his EPI Nashville leadership team combined resources to sponsor EPI’s National “Summit Giveback” in support of Abe’s Garden, a Nashville-based Alzheimer’s Treatment and Research Center, pre-raising funds for this philanthropic event. In one night alone, Gary helped raise $20,000 for the cause and brought together over 200 advisors and owners to leave a positive impact on the local community [read full article]. Just like exit planning itself, Gary Rzucidlo’s impact showcases balance, impacting owner’s lives financially, personally, and in business. 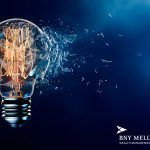 A special thank you to BNY Mellon Wealth Management, the two-time Exit Planning Summit Title Partner and the Sponsor of the Excellence in Exit Planning Awards. Your leadership is felt in action and example and has driven best practices in the exit planning community. Make plans to join the 2019 Summit. The Exit Planning Institute’s 2019 Exit Planning Summit will be held in historic San Antonio next September 23-25 (charity benefactor to be determined). Pricing for the one-of-a-kind conference is only $800 (*limited to first 50 attendees; expires December 31). Make plans to join this career-changing event, and register here. 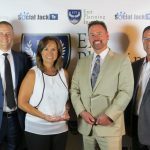 EPI is an education company, powered by an elite community of top advisors and owners, all focused on creating a valuable, transferable future for the business marketplace. Career-changing professional development. Learn more at www.ExitPlanningConference.com. Congratulations to the 2016 Excellence in Exit Planning Award Winners! Congratulations to the 2017 Excellence in Exit Planning Award Winners!